Cefoperazone Sodium Injection is used for Respiratory tract infections, Bacterial infections and other conditions. Cefoperazone Sodium Injection may also be used for purposes not listed in this medication guide. Cefoperazone Sodium Injection contains Cefoperazone Sodium as an active ingredient. Cefoperazone Sodium Injection works by inhibiting the bacterial cell wall synthesis. Taj Pharma manufactures Cefoperazone Sodium Injection. 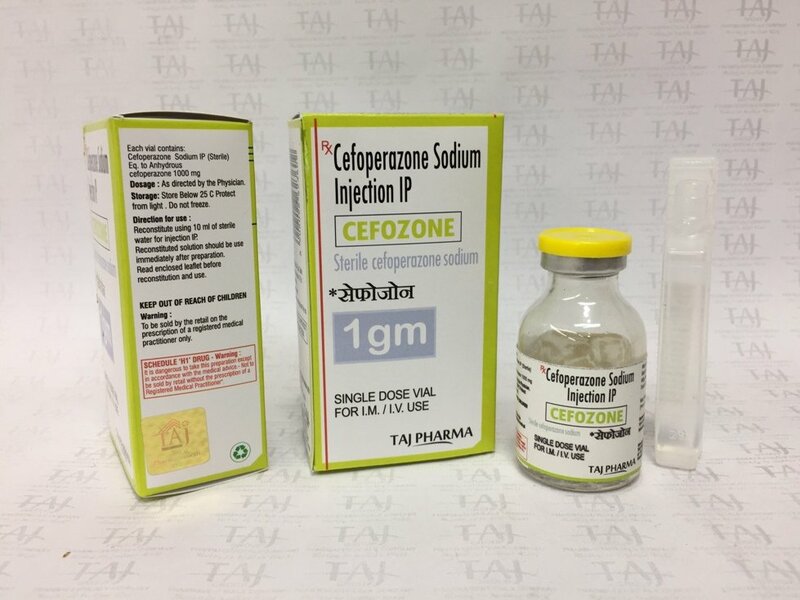 Detailed information related to Cefoperazone Sodium Injection’s uses, composition, dosage, side effects and reviews is listed below. Cefoperazone Sodium Injection may also be used for purposes not listed here. What are the uses of Cefoperazone Sodium? Cefoperazone Sodium Injection is a medicine that is used for the treatment of Respiratory tract infections, Bacterial infections and other conditions. What are the side-effects of Cefoperazone Sodium Injection? The most commonly reported side-effects of Cefoperazone Sodium Injection are convulsions or fits, decrease in kidney function, low white blood cell count, increase in liver enzymes, inflammation of a vein, and rash. The following is a list of possible side effects that may occur from the use of Cefoperazone Sodium Injection. This is not a comprehensive list. These side-effects are possible, but do not always occur. Some of the side-effects may be rare but serious. Consult your doctor if you observe any of the following side-effects, especially if they do not go away. Cefoperazone Sodium Injection may also cause side-effects not listed here. Before using Cefoperazone Sodium Injection, inform your doctor about your current list of medications, over the counter products (e.g. vitamins, herbal supplements, etc. ), allergies, pre-existing diseases, and current health conditions (e.g. pregnancy, upcoming surgery, etc.). Some health conditions may make you more susceptible to the side-effects of the drug. Take as directed by your doctor or follow the direction printed on the product insert. Dosage is based on your condition. Tell your doctor if your condition persists or worsens. Important counseling points are listed below.